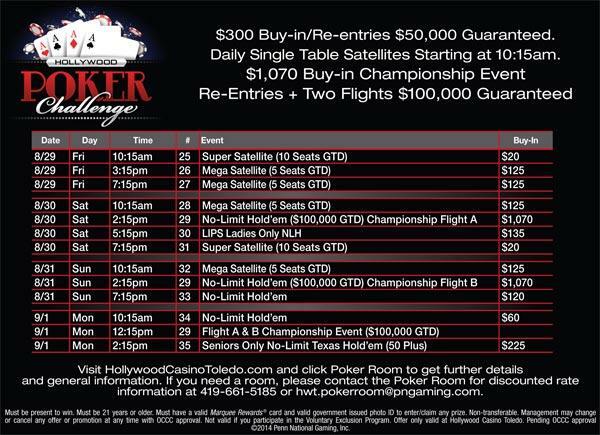 This weekend the Hollywood Poker Challenge kicks off its $100,000 guaranteed prize pool main event at the Hollywood Casino in Toledo Ohio. Saturday at 2:15pm players will participate in Day1A of the main event which features a 20,000 chip deep stacked structure. Players can re-enter if they go broke or try their luck again on Day 1B which kicks off on Sunday at 2:15pm. Players who advance from both flights will re-start day 2 on Monday at 12:15 and play to a champion! For those who want to win their way into the $1,070 main event...you can do so by participating in either $20 Super Satellites, or $125 Mega Satellites on Friday thru Sunday! The player who wins the $125 entry must provide their own travel to and from the event in addition to paying for their own hotel stay. Depending on resources, the player may ride with others heading to the event on Friday at 6pm in the South Suburbs and split hotel stay with another player. Approximate cost for ride/hotel share will be $30 for gas, and $75-$100 for three nights of hotel stay before tax. Ride back will be Monday afternoon or evening when last remaining Chicago player is eliminated from the Day 2 of the main event. For info call 708-935-2861. This promotion is via Kirk Fallah and Windy City Poker Championship and not by any other company or entity. All rights reserved. Windy City Poker Championship reserves the right to change, alter or, cancel this promotion at any time without notice or reason. NEW EPISODES are currently airing weekly on Comcast SportsNet Chicago in prime-time with replays. 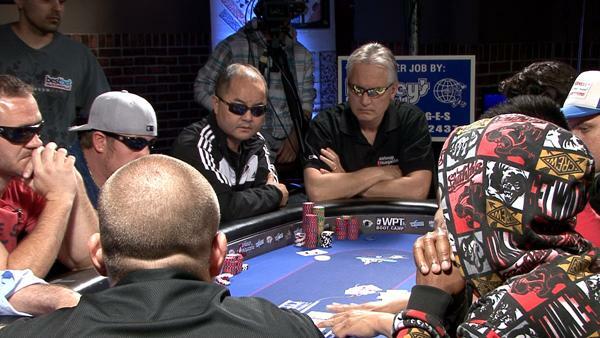 Every Sunday night @ 8pm catch a new episode of the 2014 Shady Oaks Camp charity poker event. Episode #1 featured coverage from the $1,000 televised qualifier where 7 players competed for the chance to advance to the second TV event that day. Ron Magers and Gary Carr outlasted 5 other players including Larry Lubliner, Agnes Szymczyk, Dave McDermott Sr. Bill Enright, and Lisa Maloney. Episode #1 also began the coverage of the $3k TV SNG Championship with 9 players buying in for $3,000 each to compete in a deep stack Sit-&Go. This SNG featured a 15,000 chip starting stack and 20 minute levels. Each player had a (one-time) re-buy or surrender option before the 5th level for $1,000 for a full stack of 15,000 in chips. Episode #2 continues the coverage from that $3k SNG table. 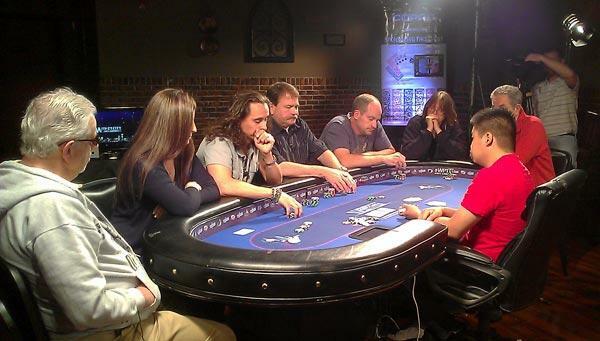 It also gives you a sneak peak at what is to come in the first ever televised $2/$5/$10 charity poker cash game. Episode #3 finishes the coverage of the $3k event and begins the coverage of the cash game on Sunday July 27th at 8pm with a replay on Friday August 1st at 2pm. Episode #4 is all about the $2/$5/$10 game and broadcasts Sunday August 3rd at 8pm with a replay Friday August 8th at 7pm. Saturday March 8th's charity poker event hosted by the Suburban Fellowship Club of Forest Park at the VFW was a great event with dozens of new players in attendance. The noon 20,000 chip deep stack tournament ran with 49 entries ($1,960 prize pool) and ended in a very profitable 4 way chop. The noon event also featured a High Hand promotion which awarded a 32" HDTV to the winner. 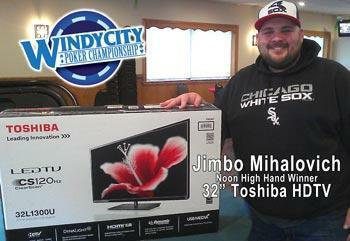 New player to the "Windy City Poker Tour" Jimbo Mihalovich held the high hand with Quad Kings and took home a Toshiba HDTV. March 1st the Windy City Poker Tour was at Ariel's Tinley Park helping out the Suburban Fellowship Club of Forest Park. The snowy Saturday offered 2 great touraments along with cash game action all day!